has become the day of reckless bottomless drinking and all things green. Think about that for a moment. The day celebrates the greatness of a man that sought to lead a people to God. St. Patrick’s Day is the celebration of Irish culture ad the patron saint of Ireland. The long and short facts of Patrick is that he was born at Kilpatrick, near Dumbarton, in Scotland, in the year 387; died at Saul, Downpatrick, Ireland, 17 March, 493. It is his in between that made him the hero we have come to know. At the age of 16, Patrick was taken into captivity by Irish marauders and was sold as a slave to a chieftan named Milchu in Dalriada, a territory of the present county of Antrim in Ireland, where for six years he tended his master’s flocks in the valley of the Braid and on the slopes of Slemish, near the modern town of Ballymena. Patrick became a missiononary who stood firm against the Druids. First of all, however, he would proceed towards Dalriada, where he had been a slave, to pay the price of ransom to his former master, and in exchange for the servitude and cruelty endured at his hands to impart to him the blessings and freedom of God’s children. He traveled the countryside preaching and battling the pagans. He entered into a final battle with a group of pagans. St. Patrick who with mitre and was arrayed in full episcopal attire, proceeded in processional order to Tara. 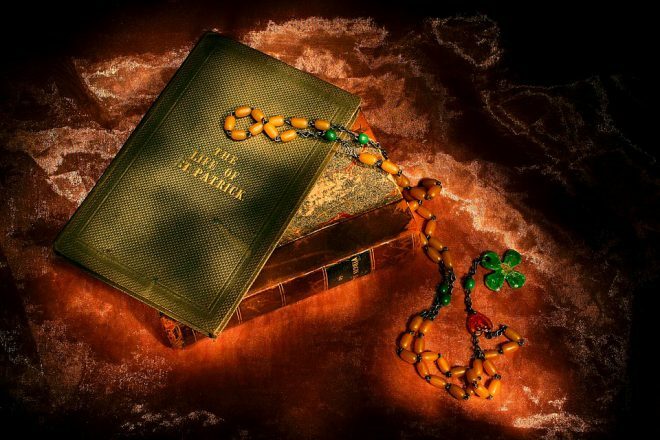 The druids and magicians put forth all their strength and employed all their incantations to maintain their sway over the Irish race, but the prayer and faith of Patrick achieved a glorious triumph. The druids by their incantations overspread the hill and surrounding plain with a cloud of worse than Egyptian darkness. Patrick defied them to remove that cloud, and when all their efforts were made in vain, at his prayer the sun sent forth its rays and the brightest sunshine lit up the scene. Again by demoniac power the Arch-Druid Lochru, like Simon Magus of old, was lifted up high in the air, but when Patrick knelt in prayer the druid from his flight was dashed to pieces upon a rock. According to another legend, St. Patrick used a shamrock to help explain the Trinity in a sermon he preached directly to King Laoghaire. He bent down, picked a shamrock, and showed it to them, and explained how the three leaves are part of the one plant, and how similarly the three Persons, Father, Son, and Spirit, are part of one Supreme Being. In any event there are many legends that surround this great man of faith. His true calling was being a missionary for God. People of Irish descent honor his tenacity and devotion to Ireland. They honor his drive to rid people impoverished and imprisoned by the unfairness of slavery. His life is a reminder that we are to pursue the good. We are to educate tirelessly.